WITH CHRISTMAS GETTING closer and closer, some of us have an idea of what presents to get friends and family, but for those who haven’t, there’s still time to get everything done before then. If you’re still looking for potential gift ideas, we’ve put together a small selection of gadgets and toys to help get you started, both practical and fun. With gifts ranging between €8 to €200, there’s something for everyone. Should you be looking for a way to relax, the mood cube can help soften the mood for you by setting the room in a number of colours. If want to give your paper airplane a boost, why not attach a small motor to it and let it fly for longer. There’s currently a third version in the works but until then, make your plane, attach the motor and let it fly for 30 seconds. If you know someone who is always leaving notes around the house or workplace, you can help save them paper by getting them this digital memo pad. It’s more practical than anything else, but it is useful if you need to leave messages. If someone you know has an iPhone 4S or older and you really want to rub in how old it is, you can turn it into a mini arcade machine. With knockoff versions of Space Invaders, Pong, and Asteroid, it’s cheap, fun and the joystick and buttons work well. There’s also one for iPad mini, although at €40, it’s probably too expensive to be worthwhile. If you’re using your smartphone constantly, you’ll know the frustration of running out of battery power. Thankfully there are a number of portable battery chargers to get, and the Veho Pebble provides good value for money. With plugs for all smartphones, tablets, and even the 3DS and Vita, it will mean you won’t have to worry about your device dying unexpectedly. Offering photographers and smartphone users something a little different, the X-Lapse lets you capture 360º time-lapse movies. If you regularly record videos on your phone or camera, it will add something different, but if you’re don’t, then you may find its use limited. One for the more enthusiastic photographers out there. Anyone who has a vast music collection on their smartphone needs a good speaker to play them on and the Gear4 Streetparty is good value for what it can do. You can connect up any device that has bluetooth and stream music from it. It also has a microphone built in to make and receive calls, should you be ok with chatting on loudspeaker. If getting a real dog isn’t possible, this robotic equivalent will please your kids. Zoomer recognises voice commands so you can teach it tricks like shaking its paw and playing dead. It also comes with an iOS and Android app so you can learn the many things Zoomer can do. If you want to lead a healthier lifestyle but don’t know where to start, the Fitbit can help you get on the right track. Syncing with your smartphone, it tracks steps, distance covered and calories burnt so you can see how well you’re doing. It also tracks your sleep pattern so it can wake you up at the right time. Once you’re used to how it works and remember to charge it regularly (3-5 days), it will come in useful as you strive for a healthier lifestyle. Alternatively, you can get the Nike+ fuelband which is more expensive (€246) but provides greater detail about your activity. Amazon isn’t the only place to buy an ereader, Kobo puts together some great versions as well. Starting off with the Kobo Mini, which has a 5 inch screen (similar to a Samsung Galaxy S IV), you can download books and sync it up to your computer, smartphone and tablet so you can manage your collection and continue reading on other devices. The Kindle started it all and has access to a wide range of books, comics on Amazon. Allowing you to save up to 1,400 books in your library as well as note taking and annotations, it prioritises ease of use. If you don’t have a smart TV but don’t want to spend money on replacing your old TV, the Roku 3 will help bridge that gap. With 450 channels to choose from like Netflix, 3 Player, and the ability to upload photos or play music directly from your smartphone, it will give your current TV a new lease of life. With so much talk on the Xbox One and the Playstation 4, it’s easy to forget that there are two great handheld consoles out there which have built up a great catalogue of games. The cheapest is the Nintendo 2DS, the basic version of its 3DS range. Designed for younger players, the handheld already has a great catalogue of games available such as The Legend of Zelda: A Link Between Worlds, Pokemon X & Y, Fire Emblem Awakening and Animal Crossing, you know you’re going to enjoy what’s on offer. 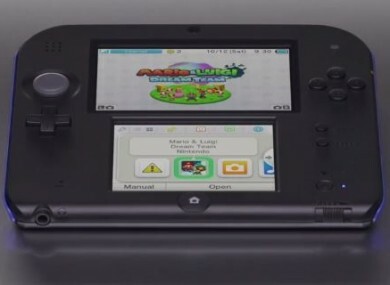 If you want the original with 3D features, the 3DS costs €220. Much like the 2DS, the Playstation Vita has both a number of great titles, both mainstream and indie, for you to play with. With a wide range of multimedia features, the Vita has a great selection of games such as Tearaway, Hotline Miami, Gravity Rush and Limbo, it a great handheld device that will serve you well. Email “Buyers' Guide: Best gadgets to get someone for Christmas”. Feedback on “Buyers' Guide: Best gadgets to get someone for Christmas”.